C-Stick Adhesion Spray - next solution from CORO Technology, that eliminates the problem of removing printouts from the operating area of FDM/FFF 3D printers. 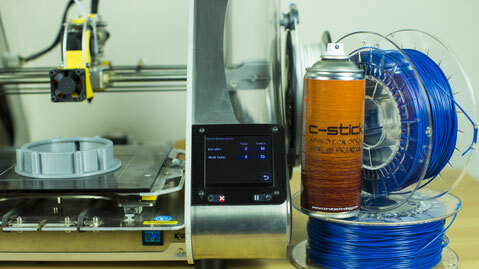 C-Stick Adhesion Spray was developed to be used with printers equipped with heated-bed. With the exponential growth in the adhesion force with regard to the temperature of the [work platform], it can be applied when printing with most of the filaments available on the market such as: ABS, ASA, SAN, HIPS, TPE, PET, PLA and other related types. 1) 20-50°C – printouts detachment zone. Adhesive force of the printouts is low, what amakes the easy to remove without the use of tools or lots of force. 2) 50-70°C – first printing zone: Glue gains adhesive properties allowing us to print with filaments with low contraction and geometry free of sharp transitions on the bottom plane. 3) 70-90°C – second printing zone. Here we observe a significant increase in adhesion force. It is recommended for large printouts with unlimiteds geometry. 4) 90-120°C – third printing zone, where temperature limit is up to 120 degrees, which grants us highest possible adhesion force. This enables the printing of very large and complicated details, even of materials with high contraction. Especially recommended for ABS and similar materials. Application of C-Stick is very simple, all you have to do is mix content of the can thoroughly and apply a thin layer of lacquer on previously degreased working platform. When using the product, you should maintain precautions that can be found in the product description, available at our website. In particular, you should remember that the application should be made in a well-ventilated room or outdoors.